Lilly was only 9 months old when she was found upside-down in an overturned cat carrier, her limbs bound with electrical tape. No one knew she was in the car until they heard her meowing for help. On Saturday, a drug bust in Santa Clarita, California, discovered her in tow with a couple in possession of narcotics, ABC 11 reported. "I mean, when I first found the cat, I was like, 'no way,' the cat was up on its side," said Adam Halloran from the Los Angeles County Sheriff's Department according to ABC 11. "[She] was crammed in the back. I mean, I own cats, that's not how a cat should be treated." With her feet bound, Lilly was completely unable to move. She was "meowing loudly in discomfort" as police worked to free her from the electrical tape. According to Halloran, the owner's terrible excuse for taping up her cat's paws was that Lilly had been scratching. 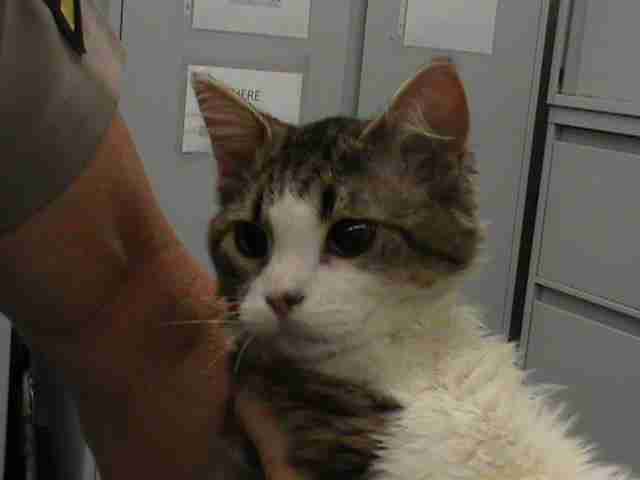 Lilly is now with the Los Angeles County Department of Animal Care and Control, which is investigating her case. Her owner is facing animal cruelty charges in addition to drug charges, ABC 11 reports. Lilly is now doing fine and is in good spirits. "[She's] spunky," Derek Brown, deputy director of Animal Care and Control in Los Angeles county, told The Dodo. "My staff told me she's got a very cute personality." Though there aren't many details available as to Lilly's immediate future, a lot will depend on the outcome of her owner's trial. With any luck, she'll eventually be put up for adoption. She could also possibly be taken in by other family members should they come forward to claim her. To learn more on how you can help protect animals from abuse, check out the Animal Welfare Institute.